You may have heard the myth “artificial sweeteners are worse than sugar. They are bad for your health, will make you fat and cause type 2 diabetes!”, or words to that effect. In this short article, we will examine if there is any truth behind these claims, or not. The theory that consuming foods/drinks containing artificial sweeteners are unhealthy, or will have a negative impact on heath, largely originated from studies carried out on animals in the USA, as far back as the 80s, and the conspiracy theories developed from there. Renwick & Molinary 2010 concluded that there is no consistent evidence suggesting low-energy sweeteners increase appetite or subsequent food intake, cause insulin release or affect blood pressure in normal subjects. Thus, the data from extensive in vivo studies, in human subjects, show that low-energy sweeteners do not have any of the adverse effects predicted by in vitro, in situ or knockout studies in animals.3 This suggests that, once again, artificial sweeteners do not have the negative impact that many have suggested, specifically when we actually look at examples of research observed in human test subjects, as opposed to animal models. Another, often touted, reason why not to use products containing artificial sweeteners, is that you ‘shouldn’t put all of those chemicals in your body’. Given the information above, that there isn’t strong enough evidence for the ‘negative effects’ of sweeteners, the argument doesn’t stand up to scrutiny. N.B. Animal studies can often be an indicator of how a compound may react in people, meaning they should not be taken as a given that “it happened in this animal, therefore, it will be the same in humans”. This is due to significant differences in how each animal metabolises the compound once it has been ingested, similar to how chocolate is fine for humans but poisonous to dogs. It’s wise to check, when you read articles making claims, whether or not the studies they have referenced are in humans or animals. For aiding weight loss, replacing caloric foods/drinks with low calorie sweetener alternatives is beneficial, as they can help to reduce the calorie content of the diet and enable a calorie deficit to be maintained. 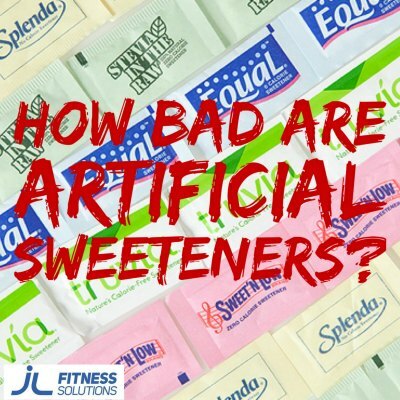 There is, currently, no concrete evidence to suggest artificial sweeteners have negative health consequences.